Equities start the day higher as October begins! I love October, I say this every October and I’m going to keep saying it every October until the recap dies a slow quiet death like The Walking Dead currently is. Buzzfeed even has this awesome listicle about “things you should cook in October” so they are excited too. The market enters the final quarter of the year sucking wind like it just ran a beer mile and my guy Carl Quintanilla posted this chart on Twitter that we need to talk about (he credited @humonthemarkets). 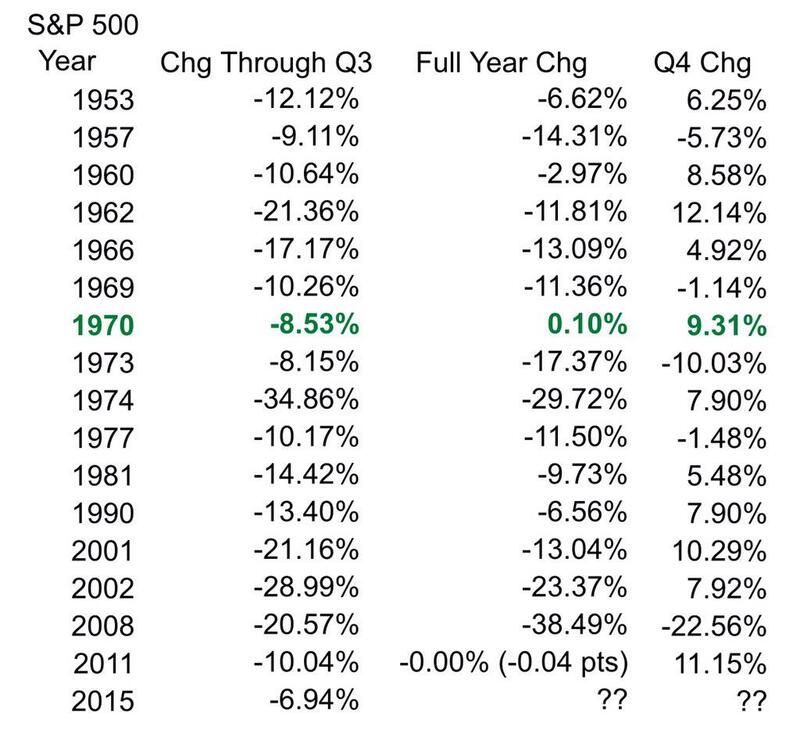 It shows the number of times the S&P has finished the year positive after being down at least 6% at the end of Q3. In case you are too busy to click that link, or your ADD is raging, the number of times is 1. One. Which is the loneliest number. Ok, well, it looks like this year is washed up, but I want you to look at is the Q4 performance in those years. In the 16 instances mentioned Q4 is positive 11 of the times, for an average gain of around 8%. So while you dump stocks and rue the day the Fed casually mentioned raising rates let us not forget that Q4 is typically the promised land for stock performance, even in really puke-tastic years. Is this trying to look on the bright side? Absolutely, it’s incredibly easy to be negative nowadays. Maybe Santa Claus can deliver a flat to slightly up year…is that too much to hope for? Maybe it is, but if he can’t deliver that maybe he can send me this so I can get away from my kids in a pool. Seriously, who else is a human jungle gym when they are in a pool with their kids? It’s brutal. After the open it was nonstop selling all the way thru lunch. I mean there must be some way outta here…said the joker to the thief. There’s just too much confusion…and the market can’t get no relief. You know what the big loser today was? Utilities. So much for hiding in safe places during a storm. FE, PEG, ED, DUK, D, EXC…all down 1.5%+. You know what else? Freaking Dunkin Donuts was down 12%. Can you believe that? Donuts. I mean if donut sales are slowing I may as well cash in all my chips and prepare for our new bartering society because the world is melting down (they had poor comps). Purple Haze, all in my brain, lately things they don’t seem the same. Amen Jimi. VRSK is going to be added to the S&P, replacing JOY. An IT services / data company replacing a good ole fashioned construction / mining equipment concern, I guess that’s the story of our economy now. 10yr yields are back near 2% so if you forgot to refi you may get another shot soon. So much for pricing in a hike. By lunch we were trading around 1,908, down half a percent. Quiet start to Oct though, didn’t have the same manic feel yesterday had. Earnings don’t start in earnest until Oct 12 so it could be relatively docile until then (at least we have NFP tmmrw). We actually saw a rally in the afternoon….how about them apples? Maybe all this doom and gloom is caked on a bit too thick my friends. There was a bearish diverge though as small caps underperformed so it wasn’t all peaches and cream. We closed at 1,923, up very small, but that is 3 days in a row higher which should break this horrendous downside momentum. Winners were Health Care and Materials and if anything needs to bounce it has to be those sectors. I’m guessing the jobs report won’t be a huge game changer for the market, it’s been between 175 and 300 for years now so let’s not go crazy. It would have to be something nuts like -200 or +500 for me to take note but I will definitely be at my desk watching alongside everyone else. Last quarter people, one last shot at glory in 2015. Make it count. Final Score: Dow -8bps, S&P500 +19bps, Nasdaq +15bps, Rus2k -28bps. Succinct Summation of the Day’s Events: Aimless start to the Quarter. Some good, some bad. NFP tomorrow will undoubtedly bring out a ton of Fed predicting. Oooof, that Atlanta GDP Now thing: On Thursday, the latest update to the Atlanta Fed's nowcast — which takes in current economic data, and unlike most Wall Street estimates and other forecasts, doesn't factor in future expected data and potential seasonal adjustments — sees third quarter GDP growth clocking in at 0.9%. Market folly has tons of ideas / notes from the Sohn Canada / Capitalize for Kids conference that just happened. Great link here. People in London be shaking their heads. Seriously, London is a first world city, what are the Jets doing here. Sentiment is still a mess: “Moreover, today’s indicator gives us an update on the sentiment via Investor Intelligence Survey. Professional advisors and newsletter editors are definitely running for the hills. Despite the fact that S&P 500 never took out the 25th of August lows, bullish sentiment has continued to drop and sits at some of the lowest levels in decades. Bearish sentiment has continued its rise since 25th of August as well, because it is just so much easier to be bearish when markets aren’t going up”. Disc Golf trick shots! Runner up for today’s final link!